Includes exclusive access to 635 pages of downloadable instructional materials. Interoception is the ability to notice and connect bodily sensations with emotions. Research states that interoception is an important factor to the development of effective self-regulation skills. Many people who experience challenges with self-regulation have underlying interoception challenges. These interoceptive differences are very common in a variety of individuals including those with autism, trauma disorders, sensory processing disorder, anxiety, depression and behavioral challenges. Some clients may experience interoceptive signals that are so strong, they are immediately overwhelmed and confused. Others experience dulled or muted interoception signals, that leave them unable to respond to emotions until they reach a fever pitch. While traditional self-regulation approaches focus on teaching clients what to do to regulate feelings of anxiety, frustration, overwhelm, etc., these approaches are often ineffective for people with impaired interoception. How can you be taught to regulate or control something you are not aware of or do not understand? The good news is that interoceptive awareness can be improved over time, with the right instruction and supports. In The Interoception Curriculum, Kelly Mahler outlines a systematic, guided process that professionals can use to develop and build interoceptive awareness in their clients using evidenced-based principals. It is strongly recommended that any instructor who wants to use the Interoception Curriculum should study the concepts presented in Interoception: The Eighth Sensory System, first, in order to gain a strong understanding of what research tells us about this sense. When you purchase The Interoception Curriculum, you will also receive exclusive access to 635 pages of downloadable instructional materials, worksheets and visual supports. Many of these materials can be customized to meet the needs of each individual learner. The Interoception Curriculum provides a framework for building independent self-regulation, by sequentially teaching a learner to notice body signals, connect body signals to emotions, and then determine what action to take to promote comfort within the body. Section 1: Body Lessons 1-16 are designed to teach the learner to notice body signals. Each lesson plan is focused on a single body part and encourages the learner to notice and describe signals within that single body part. Because positive practice during daily activity is an essential part of this curriculum, several strategies are provided to facilitate these practice opportunities in between lessons. Section 2: Emotion Lessons 17-20 are designed to teach the learner to connect body signals to emotions. Again, because positive practice during daily activity is an essential part of this curriculum, several strategies are provided to facilitate these practice opportunities in between lessons. Section 3: Action Lessons 21-25 are designed to teach the learner to use actions to regulate. The focus of the section is on finding individualized feel-good strategies, thus completing the body-emotion-action connection. Importantly, this curriculum focuses on promoting positive feelings rather than fixing ‘negative’ emotions. Although The Interoception Curriculum provides a systematic framework for building independent self-regulation skills from start to finish, it can also enhance the effectiveness of other self-regulation strategies, programs and curricula that may already be in place. Bravo Kelly Mahler! Kelly has created an invaluable resource for professionals working in the fields impacted by Interoception. If this is you, this will be a part of your main tool kit. Her information is presented in an easy to follow curriculum that also allows you to modify it for the diverse population that we work with. Following this curriculum has greatly influenced my practice as an Occupational Therapist and is positively impacting the lives of my clients. Thank you, Kelly for sharing your expertise with the world! As a young adult with autism I have found Kelly’s curriculum to be a game changer. It has helped me improve my own interoception skills and learn more about my body and emotions. This has led to me being better able to tell people how I feel as well as strategies to support my own regulation needs. This curriculum is filled with tips and concrete strategies and provides people with the tools needed to support interoception and self-regulation. 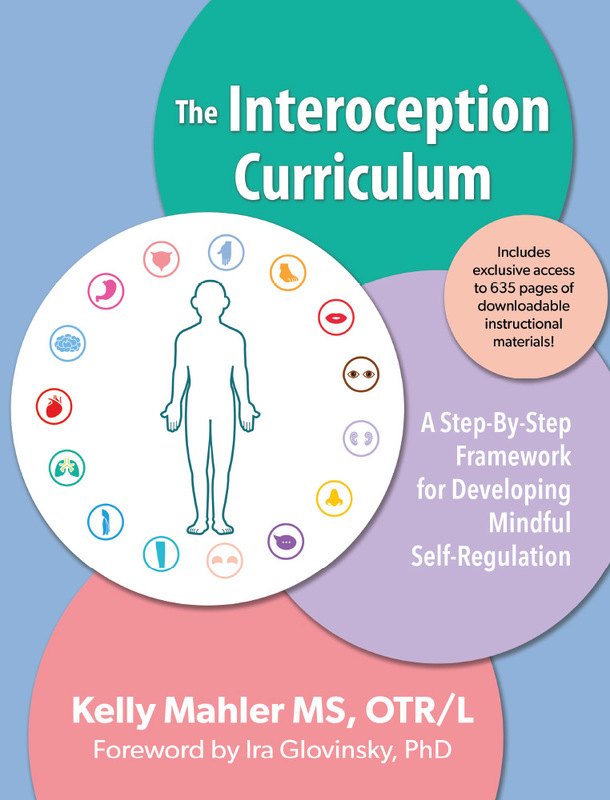 Kelly Mahler has written the definitive guide and process to integrating the concepts, language and application of interoception. She does so in a way that allows interoceptive awareness to be utilized in any therapeutic modality or setting, and for any person. Her work interweaves education and experimental practices that builds interoception within a person that is both trauma and neurobiologically informed. Her finesse in engaging the concepts and power of how relationship and connection facilitates the growth of our 8th sense is phenomenal. Kid’s Brain Tree is proud to have her transformative work in our programs. As a person on the autism spectrum, I knew when I first learned of interoception, that Kelly had explained a core deficit of those with sensory processing difficulties, knowing what you feel and knowing what it MEANS. What I didn’t have was HOPE that there was anything we could actually do about it. The Interoception Curriculum, dividing treatment into phases and making parameters explicit, bridged the gap from doing mindfulness, which we all know in theory ought to help but doesn’t, to do systematic analysis that yields actionable data that a person can use to make a meaningful change. I’m finally beginning to interpret what I feel and use it to make life changes like dressing for the weather, knowing whether I’m tired or have a headache, etc. Highly recommend! 170 full color cards designed to develop interoception skills on the go. Purchase both The Interoception Curriculum and Interoception Activity Cards and save over 20%!